"The art of Michael Amescua is included in the collections at UCLA and have been displayed in galleries from Cubato the Rincon Indian Reservation near San Diego. But the work of the 65-year-old artist can also be seen outside the pristine confines of gallery spaces. 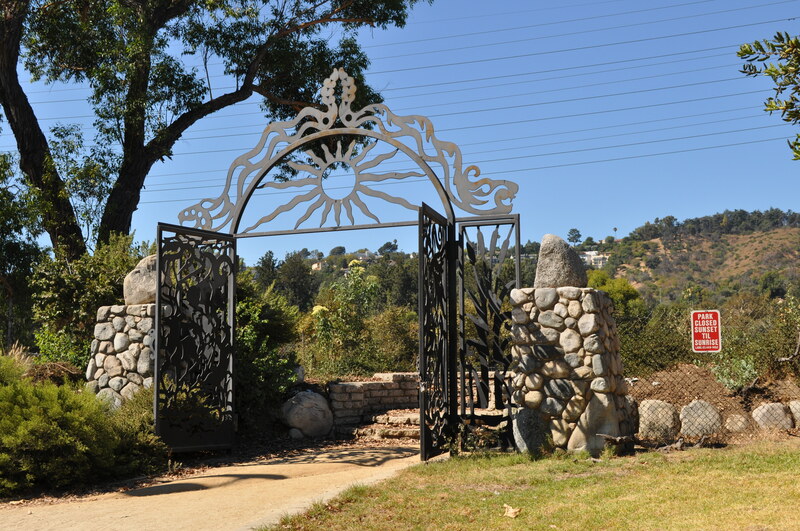 A walk or bike ride down the pathways along Los Angeles River reveal impressive gates that reflect Amescua’s skills as an artist and metalworker. "Located in northern San Fernando Valley, the Chatsworth Courthouse of the Los Angeles Superior Court opened in May 2002. Michael Amescua is one of two artists who created civic art pilot projects for the site. Amescua's majestic Tree of Life is a twenty-foot tall stainles steel sculpture situated on the exterior of the courthouse where it is enjoyed by passersby as well as by jurors in the jury assembly room. "Much of the 51 miles of river looks like something out of a “Transformers” chase scene. That’s because Hollywood production companies frequently shoot the concrete stretches, making the river famous for all the wrong reasons. That’s fine for Hollywood, not great for us. To get some carp action, try this easy day trip. First, park your car in the municipal lot adjacent to the golf course in Atwater Village. Then, set your sights on the Los Feliz Café, 3207 Los Feliz Blvd, Los Angeles, CA 90039, (323) 661-2355, for good eats. You might want to save this until after fishing, but to legally use the lot, you gotta snack. You could also bring your clubs for a quick nine after fishing. Surf ‘n’ turf. Two, walk west with rod in hand, a 7 wt. or above, loaded with 3x leader, attached to a glow bug. This is one of only a few access points you’ll find elaborately marked. Walk through artist Michael Amescua’s Guardians of the River gate, and you’re here. To your left is the Tropico Bridge, opened in 1925. Across the water, you’ll see the end of Griffith Park, along with the buzzing I-5 freeway. To your right, time to fish. Three, walk along the bike path and look for carp. It’s much easier if you can spot them, then to blind cast. Believe me, there are hundreds and hundreds in the water. Note about water: it’s reclaimed upstream. Hook carp. Hear reel whizz hopefully into backing. Repeat. Four, send me pictures of your adventure and I’ll post them. Tell friends. Go often. Remember, it’s yours. "If you’re heading down to tonight’s Willow Gulch tour, you might see this gate as you exit the L.A. River Bike Path, aka the Lario Trail, near Wardlow Road in Long Beach. There are quite a few great artistic gates along Southern California Waterways. Today’s post features an L.A. River gate that I think is the furthest downstream. It’s located in Long Beach, just west of the intersection of 34th Street and De Forest Avenue, less than a mile walk due west of the Wardlow Metro Blue Line Station. The gate is at the north/upstream end of the Wrigley Greenbelt, a medium-sized linear river park that runs along the river from Willow Road to Wardlow Road. (CC) 2015-2018 All rights reserved. These are plasma cut out of plate steel. Designs vary, painted, limited editions. "Cat Chorus" Tripod end table. All Steel. Suitable for painting. "Venus of Willendorf" All steel table, welded. Plasma cut from 1/4 inch plate steel. "Nefertiti" Single leg steel table. Cut from 1/4 plate steel.